A fireball is an agglomeration of biomass made in a balling agglomerator. In this case a cement mixer with the paddles removed. One could use other rotating drums, for example, a 55 gallon drum. I hope to find the time to write an article explaining some of the many forms of balling agglomerators. Basically this is a method to produce groups of particles without a mold or any mechanical pressure. The main ingredient is of course charcoal dust. Because of the difficulty in reducing wood charcoal to dust it is advisable to carbonize other forms of biomass. I have used switchgrass and leaves as a feedstock. This article will not explore the many methods to produce the charcoal/char, but, will only focus on the basics of how I produced my first batch of charcoal fireballs. John Tatom (the pioneer of fireballs) used starch as a binder, according to Tom Reed. So I decided to try to reproduce John's method. Unfortunately for me, I did NOT know that the starch needed to be boiled in order for it to be useful as a binder. So, allow me to emphasis the fact that one MUST boil the starch in water! Also, starch is just one of many forms of binders. I used approximately 6% starch to water mixture, by volume. More refined balling agglomerators will have means to control dust. One standard feature is that the liquid is sprayed onto the dust as the agglomerator is rotating. Some drums are enclosed. I did not have a way to spray the liquid binder hence I made myself a dusty mess. It's not to bad if you add some of the liquid then start the cement mixer and add liquid as needed. No doubt, one would develop a method as experience is gained. If you find that too much liquid was added and there is one large ball in the agglomerator that acts like bread dough, just add some more dry dust. It is also helpful to break large agglomerations up with a stick like object. This seems to be a forgiving process. Before long you will have a feel for the process. One can also add some sawdust or other fuel particles to this mixture. This would make a blended fireball. Maybe the combustion properties could be fine tuned this way or extra material could be used up and not gone to waste. I suspect it would be possible to ball agglomerate just sawdust, with the binder, in a balling agglomerator but a vary low density fireballs may result. Furthermore, fine charcoal dust would fill in the many small voids and this will help to increase the density. I did a drop test on one of my fireballs. From six feet I dropped it to a cement floor and the fireball suffered no damage. I also measures the density to be about 0.500 g/cm^3, this was with about 20% sawdust. One variable to consider is the fact that starch is water soluble. This means that they will not survive a wet environment, like out side in the rain. The last step is to allow the fireballs to dry. Picture one shows the charcoal dust in the mixer. Picture two shows the fireballs forming and in picture three you can see the finished product. Below is the e-mail that started this adventure. When I was searching for this I also found a list e-mail that explained that one has to boil the starch first, found that one a little too late! I did take the liberty of editing out somethings that may not be appropriate in this article. >excellently in my downdraft barbecue. We do a lot of re-discovering the wheel in this world and should keep it to a minimum if possible. In the mid 1980s John, working for USAID designed a Georgia Tech type "BIG BLUE" pyrolyser for developing countries. It made tar and char. 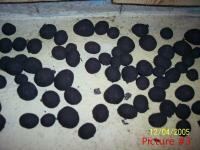 He developed a 55 gal (200 l) charcoal briquetter that made "fire balls",about 3 cm in diameter. I have a few in my laboratory charcoal collection. They do not break up when dropped from 2 m.
horizontally on rollers. Drum is closed and rotated with a handcrank. The process is analogous to making bread, when the first stage of water absorption produces LUMPS which eventually blend with the other ingredients to form dough. I presume there is a modest amount of artinvolved in knowing when to stop cranking. I believe that Bhatacharya at AIT has reports on this process. Hope we hear from him, too. Hope this article can be of help to some people!